See this in large size. 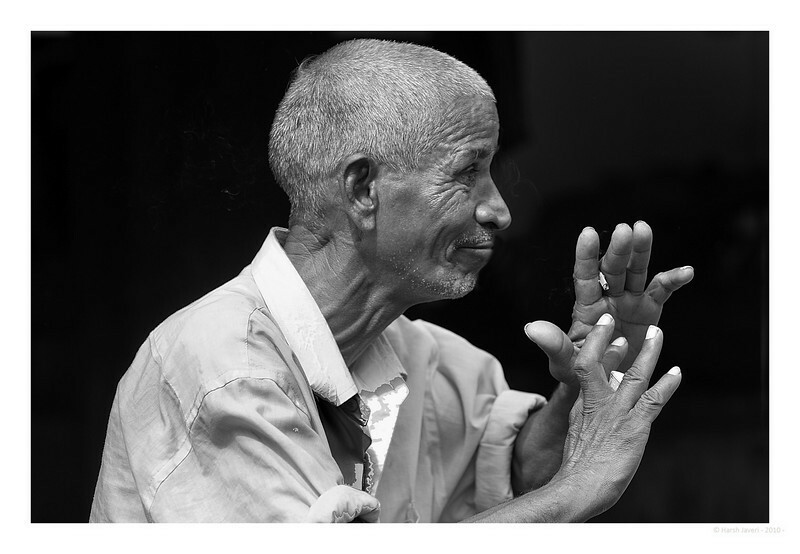 This man was full of expressions and gestures - a photographer's delight! He was smoking a beedi which is in his left hand. A beedi is a thin cigarette filled with tobacco flake and wrapped in a tendu leaf, tied with a string at one end and very popular in India and other South Asian countries. Marvelous portrait...he is certainly loaded with personality and you caught that! PERFECT!! Thanks for all the comments/suggestions on my galleries. It is a thrill to see your words. Fantastic portrait - perfect in B&W! Re the pic. The chap was quite a personality and constantly moving his head, hands etc. At the back was a shed with a bicycle which I cloned out and made it back to make him stand out. I'll try and put up the original pic later on from home. This was shot with 24-85 f2.8 lens.